Cal Fire Capt. 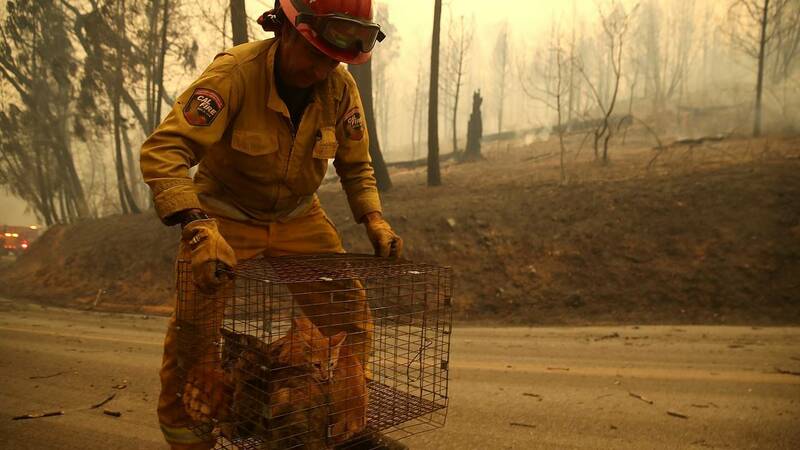 Steve Millosovich carries a cage full of cats that was found in the road after the Camp Fire moved through the area on Nov. 9, 2018, in Big Bend, Calif.
(CNN) - An additional 13 sets of human remains were discovered Monday in Northern California, bringing the death toll from the Camp Fire to 42, making it the deadliest wildfire in the state's history, the sheriff of Butte County said. Fierce winds continue to threaten lives and homes in Southern California's Woolsey Fire, which has killed two people so far. The strongest Santa Ana winds in the south may bring gusts near hurricane force on Tuesday, CNN meteorologist Dave Hennen said. "Every community neighborhood has been devastated," the woman told CNN affiliate KCAL/KCBS. Almost 15 minutes before the Camp Fire began near Pulga, PG&E's said it experienced a transmission line outage about 1 mile northeast of the town. Paradise Mayor Jody Jones said many residents are anxious to return to their homes or property to take stock of what's left -- herself included. She is living in a motor home after losing her house to the Camp Fire. She has a roof and a bed but it won't work for much longer, she said. "We're thinking about where to go next."